​What separates IT organizations that deliver transformational, game-changing value from all of the others? And how can your organization rise to the top in today’s competitive, disruptive environment? Register today for an upcoming session of our one-day workshop, Unleashing the Power of IT – Moving Your Team Up the IT Maturity Curve. Designed for CIOs and IT leaders at all levels, this session will give you practical models, techniques and insights for building the critical “soft skills” to deliver transformative IT strategies. Someone will be in touch shortly with full details. Unleashing the Power of IT is designed specifically for leaders of IT talent, including CIOs and IT leaders who are committed to developing their people with the new core skills needed for success today. 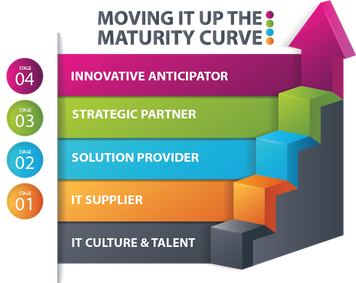 Ouellette & Associates (O&A) developed the IT Maturity Curve based on a year-long study with Babson College, uncovering a new stage of maturity — the “Innovative Anticipator” — where IT goes beyond partnering with the business and actually leads the business. When we asked CIOs of high performing IT organizations for their “secret sauce,” they pointed to 14 core competencies that focus on the human side of technology. ​Achieving IT Service Excellence: Explore the building blocks for a successful IT Service Strategy to ensure you are positioned to deliver the right things to the right clients at the right time. ​​You’ll learn simple yet elegant models, apply learning to real situations, and take back strategies and techniques that you can use immediately. ​Call 800.878.4551 or email tdinu@ouellette-online.com to reserve your spot today!